The ProForm 680 Trainer treadmill is part of Icon Fitness line of bargain budget machines that comes with all the basics, yet they include a couple of cool features such as an iPod® music port, quick speed and incline controls, and an easy-to-use console in order to add value to the machine. Icon sells more treadmills than anyone else so they know what it takes to please their legions of buyers. UPDATE: The ProForm 680 Trainer has been discontinued. To find a comparable treadmill check out the new full lineup from ProForm to see which model appeals to you. The basic construction is sound, making the ProForm 680 Trainer a decent entry level model. Get an extended warranty just in case: a 1 Year Warranty is $69.95; 2 Years is $99.95, and 3 Years costs $120. 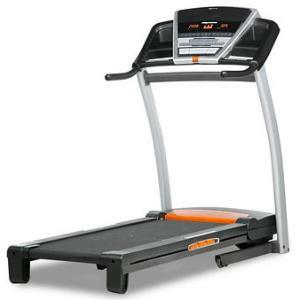 For the incredible price, most consumers are quite happy with their purchase of the ProForm 680 Trainer treadmill. If you are on a limited budget, or don’t want fussy goodies on the console, this is a good machine if you’re an avid walker. As for the features it does have; the speakers are adequate, the display couldn’t be easier, and the frame offers remarkable stability even for supporting a heavier adult user. The cushioning is somewhat lacking though walking on the ProForm 680 Trainer does provide more joint protection than walking on sidewalks. TreadSoft Max™ is a fancy name for what is only adequate deck cushioning but that isn’t an important feature at this low price. Wearing a good pair of sneakers helps you to overcome most treadmill cushion problems. 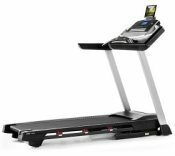 The ProForm 680 treadmill is a basic version of the 980 Audio Trainer so you can save $150 if you don’t need or want the iFit® workouts, the fan, the fold-up design, and the larger motor. With some tender loving care, the ProForm 680 Trainer treadmill should last you a few years without giving you trouble. Since the company offers free shipping (a savings of $125), we recommend you get one of the extended warranties to further safeguard your purchase. You should also consider purchasing a treadmill mat. This accessory is vital to not only protect your floor or carpet; it will also extend the life of the motor and rollers.